With Vincent Bottesi it is free delivery all the time without a minimum order value and you still get to choose the method of delivery – whether it is at home or at work, with Colissimo services, it is all at your conveniences ! From your account, you can maintain several mailing addresses (up to you and your availability). 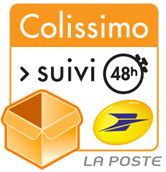 To ensure a quality of delivery, we chose to trust the specialist in fast delivery : La Poste. Thanks to the Colissimo services, with tracking of the parcel and delivery (handed) against signature, we make sure to provide a customer service that meets the quality of our creations. If you order today before 2 pm, you are certain to receive your parcel within 48h (working days). If you are out when the postman comes, the parcel will be stored in the nearest post office. As soon as your order is sent, you will receive an informative mail with the corresponding delivery tracking code. You can also access this code from your customer account, in the section « my orders ». You can then check the follow-up of your personal order at all times. The order has been delivered to you but the size you chose is whether too large or too small, or you prefer another colour… You would like to exchange your shoes for another size or colour ( subject to practical feasability). The transport costs for the return of the products will then be at your charge. The shoes could only be exchanged when the reception service confirms their good condition.